Securotec studies, designs and produces pertinent comprehensive solutions in the sectors of human safety and the protection of equipment. Securotec understands problems related to mobility, the weight of equipment, and the necessity for quick assembly and disassembly. We offer a full range of tents and other inflatable structures for various requirements in the fields of emergency relief and protection in the case of CBRN threats. Our design office, equipped with 3D design software, and our professional expertise help us meet very demanding lists of specifications and find innovative solutions to respond to your changing needs over time. 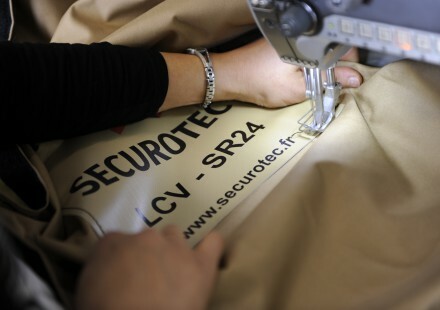 Our partnerships with technical fabric manufacturers, the industrial tools and techniques which we are constantly updating and improving, and our very strict quality control standards enable us to produce finished products whose reliability is unquestionable. Securotec offers standard or customised solutions for all your architectural fabric projects for civilian or military use. Thanks to our reactivity, attentiveness and expertise, we have the technical and logistic solution adapted to your needs. Our reputation is a result of years of experience in the manufacture of inflatable products to help solve problems related to permeability and CBRN threats. Expert management of the supply chain ranging from an in-depth study of your needs to sourcing the appropriate materials, provision of the necessary savoir-faire for high frequency welds and waterproof seams, rigorous quality control at each phase of production, and tests carried out on the finished product ensure a high-performance service. Our in-house production is 100% made in France. This allows us to guarantee an after-sales service and upgrade your equipment during its life cycle according to your needs.